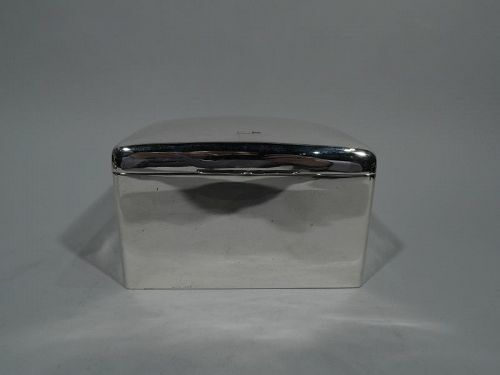 Edwardian sterling silver box. Made by Walker & Hall in Chester in 1906. 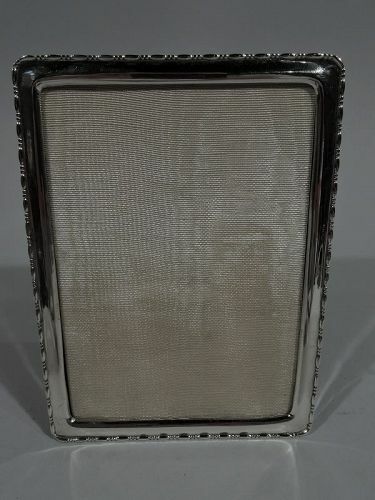 Rectangular with straight sides and curved corners. 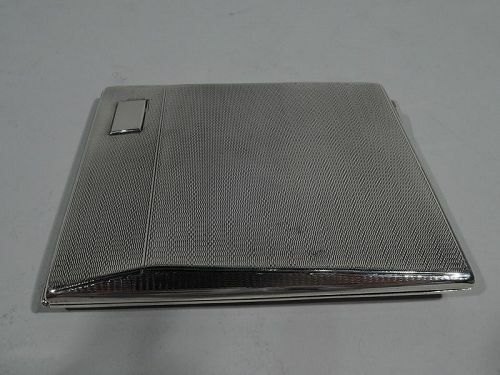 Cover curved and hinged with double-scroll tabs. Box interior wood-lined. Cover interior gilt. Box underside leather-lined. Fully marked. Very good condition. 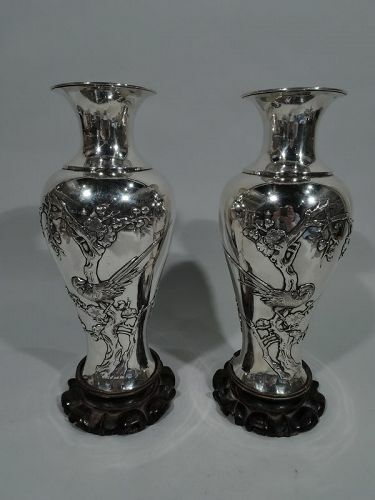 Pair of Chinese silver vases, ca 1900. 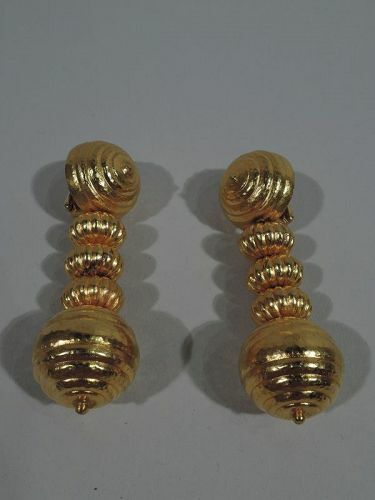 Each: Baluster with spool neck and flared mouth. Applied and engraved ornament: Winding, craggy blossoming prunus branches and perched and flying birds. Stained rosewood mount. Chinese characters marked on vase underside. Very good condition and patina. Minor wood losses and wear. 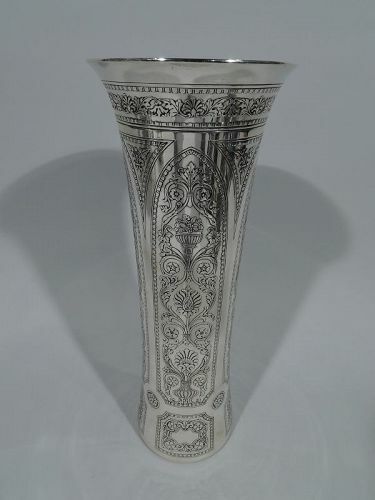 Chinese silver vase, ca 1900. Classical amphora with domed foot, concave neck, and flared mouth. Branch-style scroll handles mounted to neck. Oval frames with bamboo, blossoming prunus branches, and perched birds including one severe owl. Leaf-and-dart at base. Marked with Chinese characters. Very good condition and patina. 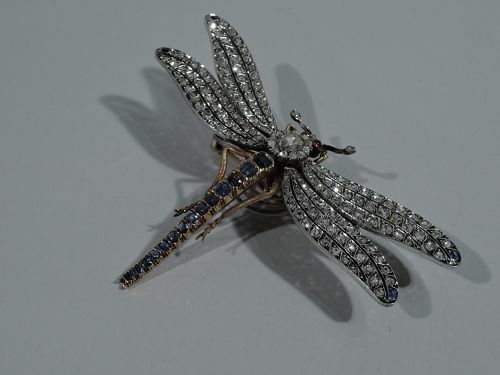 Art Nouveau tremblant dragonfly brooch in 18k gold and platinum set with gemstones. Body comprises rose-cut diamond (approx. 3/4 ct) bordered by small rose-cut diamonds. Tail has graduated oval and faceted sapphires. Wings have rose-cut diamonds with single oval faceted sapphire at tip. Eyes are round cabochon rubies and each antenna terminates in rose-cut diamond. In Parisian retailer’s box. France, ca 1900. 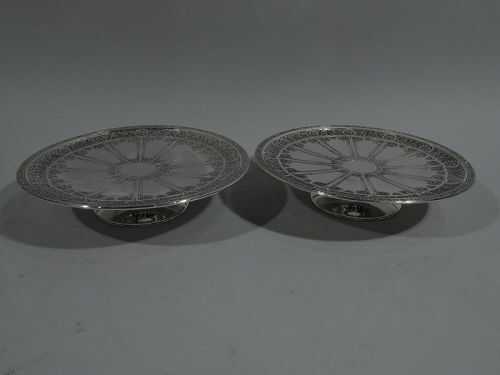 Assay marks. Excellent condition. 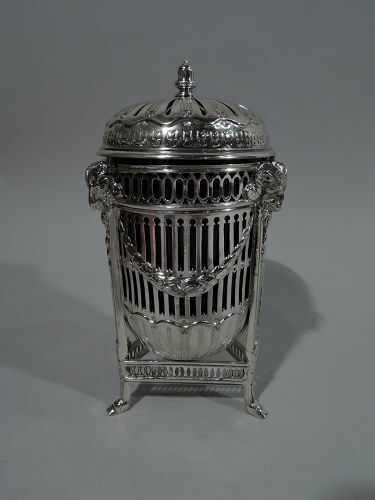 Edwardian Neoclassical sterling silver potpourri. Made by George Nathan & Ridley Hayes in Chester in 1904. Ovoid urn in tripod frame with ram’s head monopodium supports and pierced stretchers. 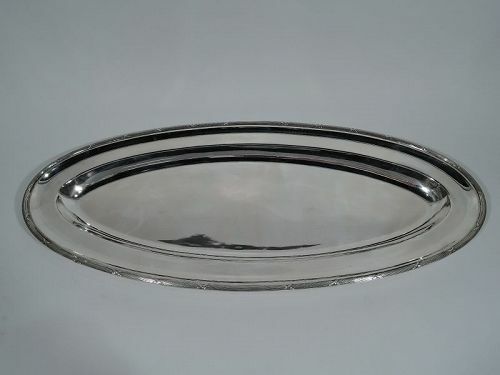 Pierced sides and base fluting. Cover domed and pierced with acorn finial. Detachable cobalt glass liner. Fully marked. Very good condition. 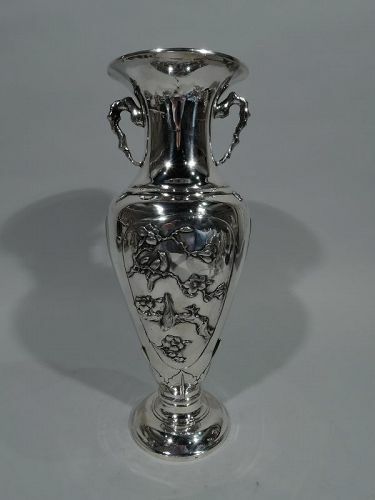 Modern Classical sterling silver vase. Made by Tiffany & Co. in New York. Concave cylinder with acid-etched Grotesque shells, vases, and foliate in Gothic arcade. At base rectilinear frames with same of which one with interlaced 2-letter monogram. Fully marked including pattern no. 18173A (first produced in 1911) and director’s letter m (1907-47). Very good condition with strong definition. 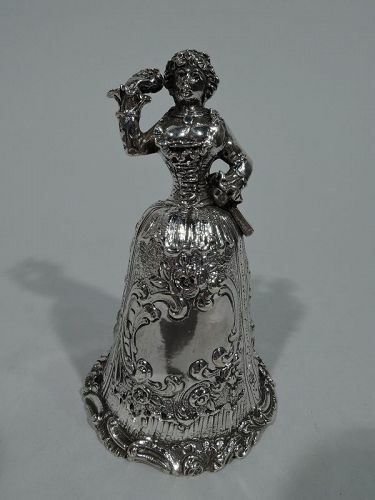 German 800 silver figural bell, ca 1900. A bosomy, tightly corseted lady holds a fan with hand on hip and a bouquet in raised other. Voluminous skirt with applied scrolled rim and scrolled cartouche (vacant). Hallmarked. Very good condition.